I grew up a Georgetown basketball fan. My mom turned me onto Georgetown basketball and I watched most of their games during the Patrick Ewing, Alonzo Mourning, and Dikembe Mutombo years. 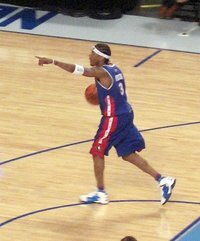 Although Patrick is and always will be my favorite Georgetown player, I also love the little guy Allen Iverson. The first time I saw him dribble the ball as a freshman at Georgetown I was hooked. He is simply one of the most enjoyable basketball players to watch. He is tiny and yet he never fails to take it right at the biggest and strongest players in the game with an fearlessness that you have to admire. Last night we took our kids down to Denver to see the NBA All-Star game. It was a blast. The east finally had a team that could compete with Iverson, Shaq, LeBron, Duane Wade, and a host of other great players. 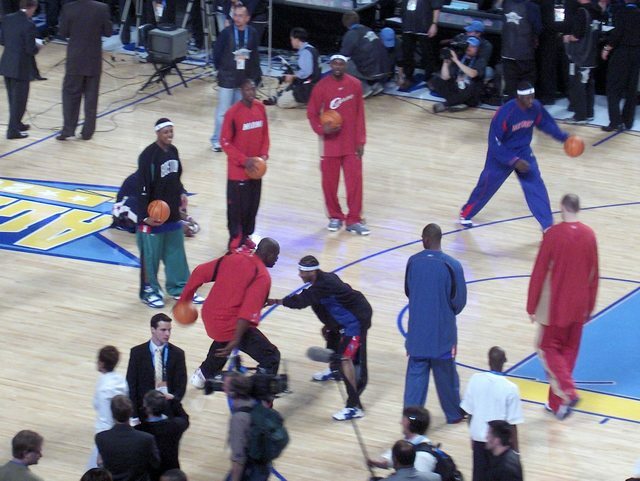 We got there an hour before the start and got to watch these huge stars playing around with each other in warmups. 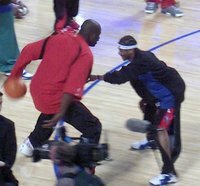 Shaq and Iverson must be good friends because they were having a great time with each other. 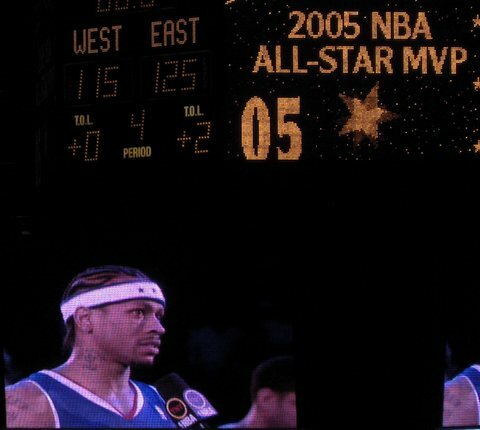 The game itself was like all NBA All-Star games, pure showtime. There were alley-oops and dunks, big time three point shooting, and very little defense. The game was close most of the way, but the east pulled away in the end to win 125-115. And the MVP? None other than the little guy, Allen Iverson, who did everything for the east and deserved it. It made for a great ending for a great night. I was so happy to be there to witness it. Newer post Fixing Venture Capital (continued) Older post Whither Tivo?